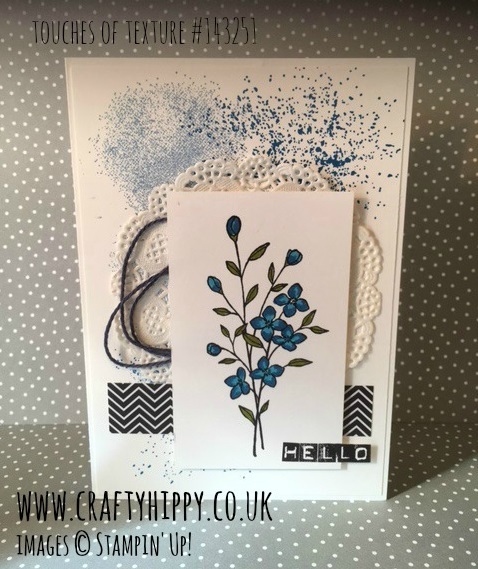 This gorgeous creation was one of the cards we made in class last night and is a CASE of an Amy O'Neill card. The stamp set we used was Touches of Texture - except for the sentiment which was made using the Labeler Alphabet set. I used our Many Marvellous Markers in Tempting Turquoise, Pacific Point and Old Olive to colour in the flower stamp, which I stamped in Basic Black Archival Ink. I used a strip of Pop of Pink Speciality Designer Series Paper and finished off with some Night of Navy Solid Baker's Twine, and one of our Lace Doilies. Join my team for only £99 - it's so much fun!